The Power Purifier, which was a through-development of the Black Sticks, has now evolved into two absolutely fantastic powercords. Meet The First and Neo. 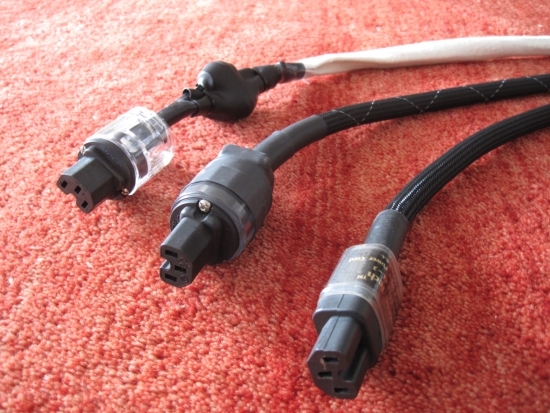 Options include extra length, alternate sleeve colors and other connectors. Rebate if buying multiples. Free blackdiscus sample to get a taste of the Power Purifier. 30 day money back guarantee. The Mad Scientist are on something of a winning streak! I’ve reviewed several of their products and with each new product, the performance beats the performance of the last. The last products I reviewed were the Power Purifiers and their effect was staggeringly large, too large even for my taste. I like to think that it’s partially because of my comments on those products that The Mad Scientist have evolved their techniques, and re-evaluated the materials used, to come up with the new products under review here. 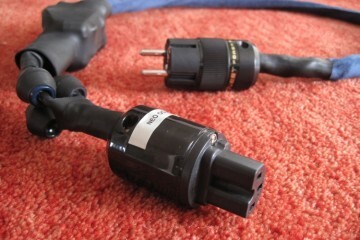 The First and Neo power cables may look odd, but they truly deliver the sonic goods and are absolute bargains. First experience with the new cables was with my Levinson 390s cd player and from the first musical notes (not even run in) it was already clear that these are superb powercables. The First is the simpler cable of the two. This cable uses 11AWG (2.3mm diagonally, 4.17mm2) copper wire with teflon insulation with an extra cotton sleeve over live and neutral. The magic ingredient is the addition of 3 Kegs covered in shrinkwrap: the Kegs used here are the better matching original ones without Neodymium magnets. 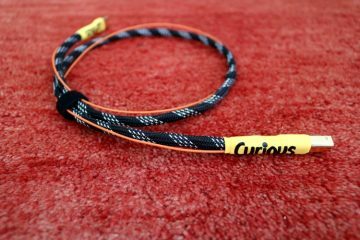 The whole cable is covered in another layer of cotton and finished with no-name Chinese made audiophile connectors. 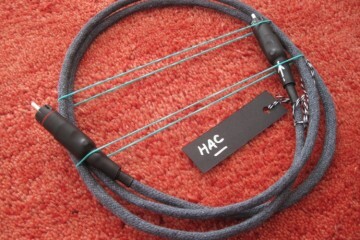 Even without listening, one can conclude that this cable is a steal at $139. It is priced so keenly in an effort to convince non-believers that powercords really do make a difference. I’m here to tell you that the difference here is not subtle: even this most affordable model (pictured above) already sets a high standard. 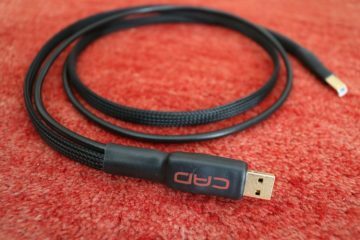 The First is a fast-sounding and lively cable, but without any harshness or strain. 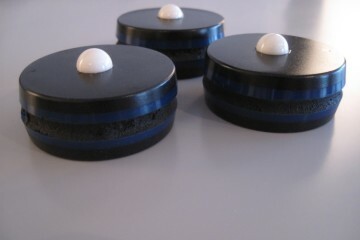 Bass is tight and articulate, midrange is open and communicative and treble is pure, extended and sweet. The only thing I could say to count against it would be a slight leanness in the midbass and lower midrange, a lack of color if you will. Then again this aspect is highly system-dependent and subject to taste. I prefer fuller sounding cables, because my system can sound overly clean if I’m not careful. There are plenty people who don’t like color(ation), and the match with a Wadia 861 in a friends’ system further substantiates the importance of system synergy. The First however is very neutral and also sounds very natural. Its timbre might be a little lean, but its midrange is pure and not marred by any congestion, which makes it acoustically very convincing. Extended listening in my friends JW’s setup was relevatory, in that The First was the first cable that JW could see himself using instead of his usual powercord, a Lapp 110CY 5G2,5 with Gold Oyaide connectors. The Lapp is very basic, and has very strong character that you either like or loath, but somehow it has always been synergistic with the Wadia in his system. I have tried to change JW’s mind for over 10 years and only now with The First, even if it sounded entirely different than the Lapp, there was no incentive whatsoever to change back to the old cable, or to move to another cable, if it wasn’t for the availability of the Neo. While listening to a few more tracks we noticed that the cable continued to improve the longer it played. I want to stress that this cable sounds entirely stress-free from the get-go, but our experience on the first evening shows that it starts to open up more harmonically and also gains fluidity after the first hour or so. 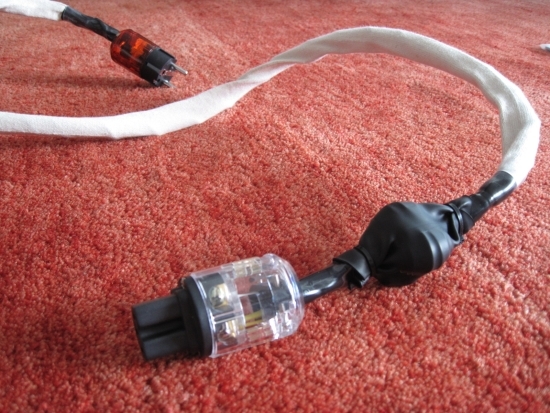 While the improvements are no longer obvious after the first hours, the cable might benefit from extended running in and being left in place. I have not experimented with this but it is likely that the teflon needs to settle for a little while longer after cable handling. The more luxurious Neo is similar in construction to The First in that it shares the teflon-clad 11AWG (2.3mm diagonally, 4.17mm2) copper wires, of which live and neutral have a separate layer of cotton and the whole is covered by another layer of cotton. The Neo also uses Kegs, but this time with the addition of Neodymium magnets in two of the three Kegs and of course the highly effective Power Purifier elements. In my own system, The First was a little bit too lean for my taste, but when I moved to the Neo to feed the Levinson 390S, I was perplexed. All the positives of The First remained, but with its downsides entirely taken care of. Bass was fuller and deeper, midrange was more voluptuous and richer and soundstage was wider and more enveloping. The whole sound had taken on a more seductive, even magical feeling. Importantly, the Neo accomplishes this without sacrificing midrange clarity and overal pace and attack. This is a really important thing to note because there are plenty cables that can sound either very informative or very romantic, but very rarely are these two qualities combined. Until now that is. 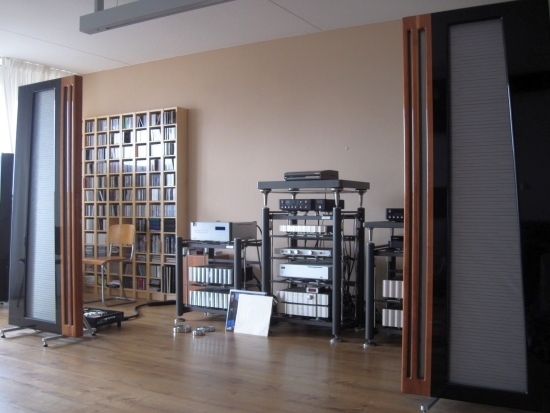 My own system usually needs some added warmth, but interestingly the Neo doesn’t actually sound warm – it is just as neutral and natural as The First, but somehow it still sounds more relaxed and much richer. I don’t know how this is possible, but when using the Neo, my Levinson 390S has never sounded better. It has improved clarity and focus and pacing, but all the same, sounds luxuriously rich, just like when using the Harmonic Technology ACII powercord. 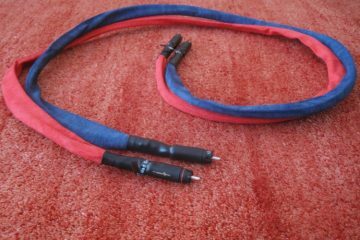 That is: without the slight dynamic constraint and blurrying of transients that the Harmonic Technology cable adds to the sound. The Alpha 3 (with FI35 connectors) sounds dynamic, fast and lively, while avoiding harshness and, dryness for the most part. I wouldn’t call this cable fluid, but it’s also not overly dry. With some components the Furutech can sound very nicely powerful and well-paced but with others it can tilt over into an overly clean and too-technical sounding cable. It does not sound threadbare, but also cannot by any stretch be said to sound rich. In my system I use it with the Wadia 781, which seems to work well, as long as the Wadia’s internal output level switches are not set to maximum volume. Substituting the Alpha 3 for the Mad Scientist Neo made for an interesting comparison. While the Alpha 3 could be said to sound more robust, it also clearly had the more sober approach, appealing to the mind rather than to the soul. The Neo on the other hand provided a much more magical presentation, without sacrificing speed or low level resolution. The only area in which the Alpha 3 was better was bass, which was both more solid and had better drive. After the surprisingly positive result in my own system, I also tried the Neo in my friend JW’s system. As mentioned above, we were already deeply impressed with The First, sounding much more at place in JW’s system than in mine, so much so that we could listen to the entire CD without wanting for another cable. But, of course, when the more upscale Neo is also waiting to be listened to, we can only oblige. The Neo already sounded fantastic in my own setup, but the way that it gelled in with the Wadio 861 in JW’s system was beyond anticipation. 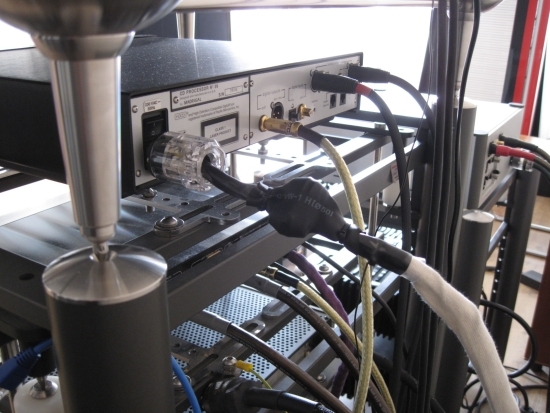 But before I go there you should know that we also listened to some Harmonic Technology cables in this system. As mentioned above, JW has been attached to his Lapp 110CY 5G2,5 cable with Gold Plated Oyaide connectors for a very long time, and no matter what cables I brought around, he wouldn’t part from it. While this particular Lapp cable does indeed fit JW’s system well, it has been clear from the start that it also has some downsides, such as brittle treble and a lack of focus and low level detail. This is why I brought two Harmonic Technology cables. The very first model called Pro AC II CL3, and the latest model called ACII +. I already knew that the old model sounded blurrier and dynamically more constrained than the latest model, but came around one on the second hand market and figured it nice to make another cross comparison so many years after I had first done so. The new models work very well in my setup: I use 4 of them! But I know that they are not the last word in dynamics. Substituting JW’s Lapp for the original Pro ACII CL3 made a strong case for parting ways with the Lapp. The HT has a nicely full tonality and rich timbre, just like the Lapp, but with added low level detail, treble air and fluidity. But it was also evident that the Harmonic Tech cable did not possess the Lapp’s bass fullness and drive. Even more so than in my own setup, the HT sounded dynamically restrained and lacklustre in the bass. You should know that Wadias react very strongly to powercords, and cables that limit dynamics on one way or another are generally a no-go. Moving on to the latest model ACII + provided instant relief: back was the articulation, PRAT was improved and bass was fuller and more forceful, al this while maintaining treble air and fluidity. But the dynamics were still wanting. 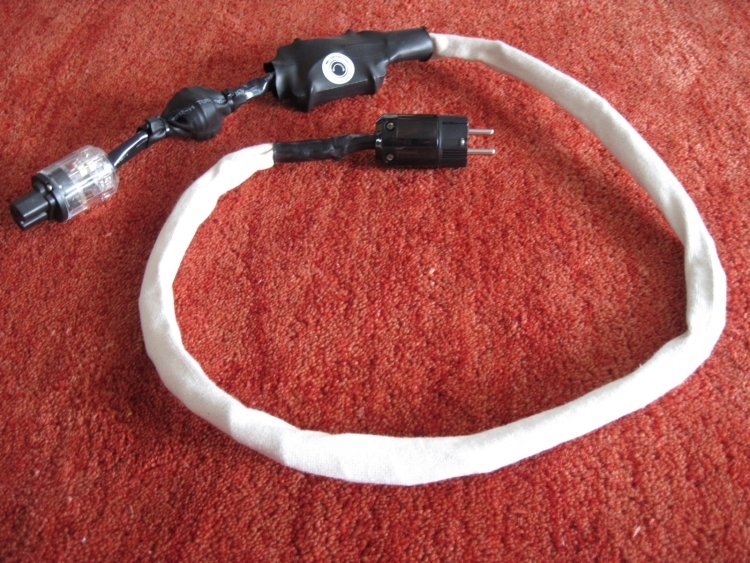 Having known JW for a long time, and knowing that we had so far not succeeded in finding the perfect power cable for his Wadia, I feared that the Mad Scientist Neo would prove too much for the Wadia, and that it would suffocate dynamics and transient sharpness, just like the Harmonic Techs did. How wrong I was! As experienced in my own setup, the Neo offered all the traits of The First, but perhaps with an ever so slightly less articulate bass. But even in JW’s critical application, this was negligable, even more so because all other aspects of sound improved so much. Seemingly effortlessly, the Neo just filled in all the items on our wishlist one after another and provided exactly what the doctor ordered (oftentimes I actually call JW “Doctor Auer”). For the first time in history, my friend JW’s Wadia saw its weak sides tended to, and its strong sides encouraged. Simultaneously, the Neo managed to provide most of the Lapp’s strong areas without any of that cable’s downsides, and in the process it managed to offer all the Harmonic Tech’s traits without sacrificing midrange clarity and communication, or transient speed and sharpness. 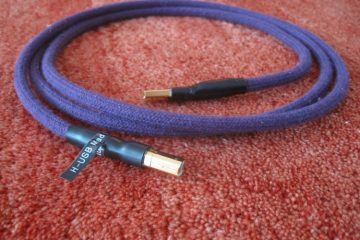 There’s a magical completeness and rich velvety luxuriousness to this cable’s sound, but without any of the syrupy or blurry side effects. It really has to be heard to be understood. Needles to say, JW and I listened to the entire CD without wanting to move to another cable. 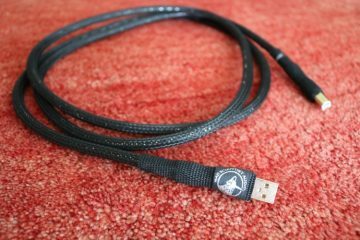 What’s more: JW dreaded to part with the cable so I left it with him for extended evaluation. 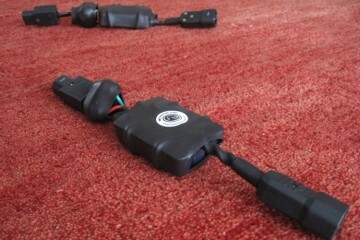 The supplied connectors look handsome and are decent enough and obviously work very well in the whole concept. 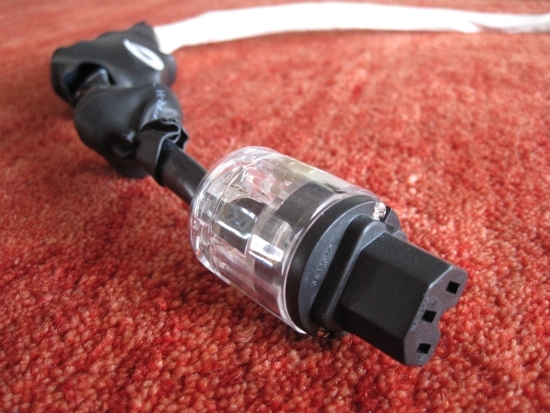 There are more advanced connectors on the market of course, but they are invariably a lot more expensive and would add a large sum to the price of the cables. Also, I wonder if an IeGO or Furutech, or Oyaide would only add positives to the sound, without adding some negatives as well. 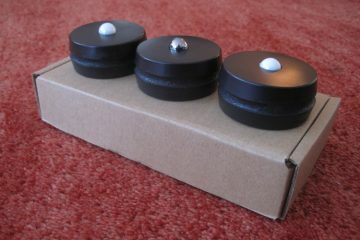 After all, folks, it’s always about balance in the wonderful world of audio! The Mad Scientist is clearly on a winning streak, each new product trumping the last. The current batch of power cables is seriously something else. No longer in the experimental stages, but true audiophile products to recon with. 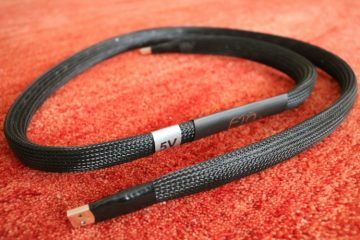 The First is a fantastically neutral and natural sounding cable that is not only an upgrade on pretty much any affordable cable but is also way too cheap for what it offers. 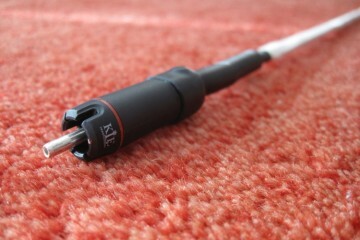 The Neo is not only good at the price, but simply one of the most musically involving cables I’ve heard at any price.